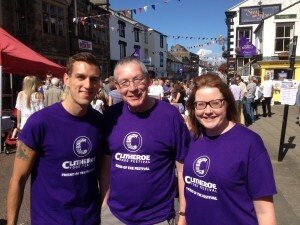 One of the most important ingredients to the success of the Clitheroe Food Festival are our fantastic volunteers, who meet and greet visitors, and generally help with the organisation of the event. Each year we need help to run our festival, so if you feel you have the time to get involved we would really appreciate it. The main role of festival volunteers is to make visitors welcome and help them to enjoy both the festival and the town. Volunteering can be rewarding and fun, and also provide valuable experience. If you are interested being one of our festival volunteers please email tom.pridmore@ribblevalley.gov.uk or call 01200 414496. Whether you have a day to spare, or you are a college student who needs the work experience, we’d love to have you on-board!